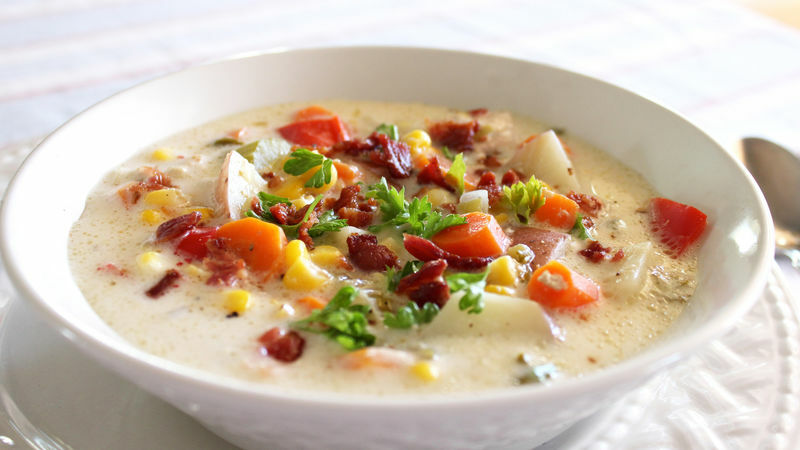 In slow cooker, mix all ingredients except whipping cream, cornstarch, salt and pepper, bacon and parsley. Cover; cook on High heat setting about 4 hours or on Low heat setting 8 hours. In small bowl, beat whipping cream and cornstarch with whisk until smooth. Stir into mixture in slow cooker. Cover; cook 15 minutes longer. Season chowder to taste with salt and pepper. Garnish individual bowls of chowder with parsley and bacon. This dish is great served with biscuits and a salad. If you don’t like to cook with wine, you can substitute chicken broth.